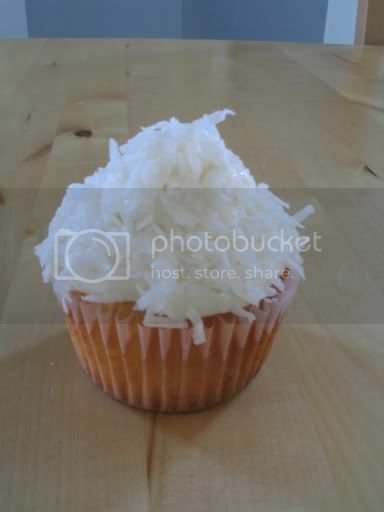 Cupcake, my love: Ovens ding, are you listen'? Ovens ding, are you listen'? With the leaves completely off the trees and the continuous overcast, it can only mean one thing...CHRISTMAS!! And with Christmas, and the holiday season comes lots and lots of baking. My holiday baking list this month is outrageous. There are so many recipes and goodies that I want to make that I don't even know where to begin. The good thing is that it doesn't really matter where I start, because every thing is so scrumptious that there is NO disappointment! Starting with tradition, we always have to have chocolate chip cookies on hand. And what better way to kick off holiday baking than with a batch of warm melty chocolate chip cookies? While I was at the store buying my baking ingredients I happened along these festive chocolate chips and knew I had to have them. They were the perfect addition to my cookies! 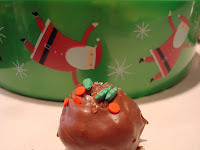 Another tradition in my family is Peanut Butter Balls. I don't know when this tradition started but I remember as a little girl helping my mom in the kitchen make these devilish little treats. 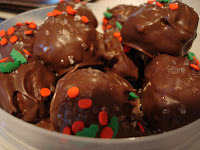 I used to eat handfuls of them...which thanks to my slowing metabolism, I can't do anymore...but a few little Peanut Butter Balls won't hurt :) Made with crunchy peanut butter and rice krispie treats, these yummies have just the right amount of crunch to them, and then are topped with a smooth milky layer of chocolate!! 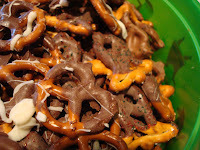 The last tradition in our family is chocolate covered pretzels, hey, what can I say we like our chocolate!!! And these pretzels need no explanation. Sweet, salty and crunchy, the perfect combo. 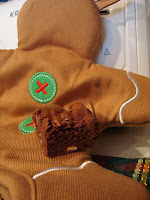 Ginger, ginger, ginger...what is the holiday season without a little ginger? I'm a little tired of the traditional gingerbread men though, so I thought I'd make a fabulous Ginger Cookie. And fabulous it was! 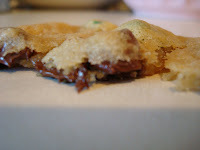 This cookie had just the right amount of spice and a little kick right at the end, thanks to a tiny bit of cracked black pepper mixed into the dough. 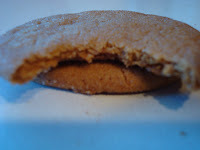 To me, the perfect cookie has a crisp edge, but a moist, chewy center, and this was exactly the texture of my Ginger Cookies. 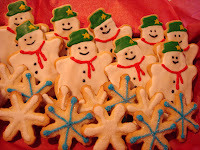 I could literally eat a dozen of these warmly spiced cookies! 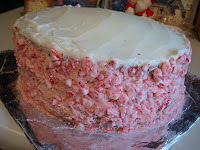 A new cake that I wanted to try this year was Chocolate Peppermint Cake, and boy am I glad I did. I took a basic chocolate cake recipe and kicked it up a few notches with a splash of peppermint extract. And let me tell you, the house smelled sooo good and festive that I almost turned into Mrs. Claus herself :) To top of my deliciously moist chocolate cake I made a simply vanilla buttercream, adding a tiny bit a peppermint extract and a splash of peppermint schnapps, I could've ate the frosting by itself, it was that good!!! The peppermint flavoring of the frosting matched perfectly with the chocolate cake, and neither one was overbearing, so it was a success! 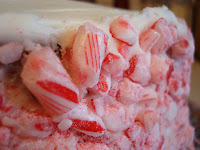 And to give my cake a little holiday decor I crushed up some candy canes and covered the sides of this to die for holiday cake! Last but definitely not least is my two different brownies. The first batch was just good ole fashioned chocolate brownies with pecans. Perfect for any chocolate lover, these little babies get extra chocolaty with the addition of chocolate chips. Hey, I told you already, I like my chocolate!! I only wish I had some peppermint ice cream to scoop onto these decadent brownies! And while I can't get enough of these brownies, I must say that my White Chocolate Blondies have to be one of my all time favorite brownies! 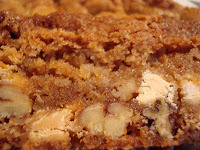 Full of White Chocolate, Butterscotch Chips and Pecans these blondies will leave you speechless. I had to pry myself away from the tray :( The secret to making my blondies moist is the addition of coconut, which you can't taste at all, but lends a great texture to the blondies. And here to display my treats is my buddy Ginga, who helped me out a lot in the kitchen these last few days! If it weren't for him I would have burned oven hands :) Thanks Ginga, I love you! 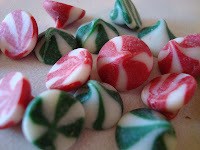 Well there you have it bloggers, the beginnings to my holiday baking. Stay tuned for more festive treats, and may you have a wonderful and happy holiday!! 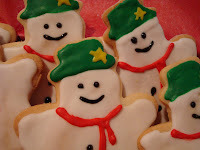 Your snowman cookies are so impressive. You just pound out amazing dessert after dessert. 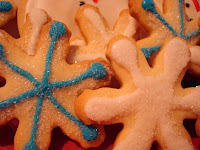 YUM i LOVE ur snowflakes and snowmen!!! 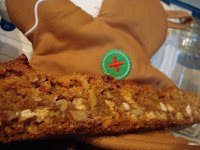 great blog too i love reading about ur baking adventures!! !